The elite pilot of the new collection is IWC’s Le Petit Prince Big Pilot Watch (around $326,650), a continuation of timepiece tributes to French aviator and author Antoine de Saint-Exupéry, which is limited to just 10 pieces. The new timepiece is IWC’s first pilot watch to come with a constant-force tourbillon and is being offered in a hard gold case for the first time. 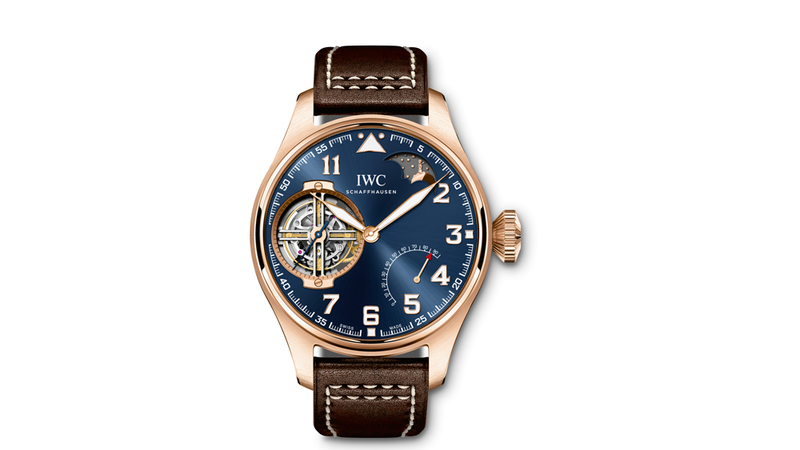 In fact, it is the first time IWC has ever used hard gold, a new version of red gold that is modified in the manufacturing process to be harder and 5 to 10 times more wear-resistant. The 46.2mm by 13.5mm watch is also equipped with a moon phase that won’t need to be adjusted for another 577.5 years and a power reserve of 96 days. 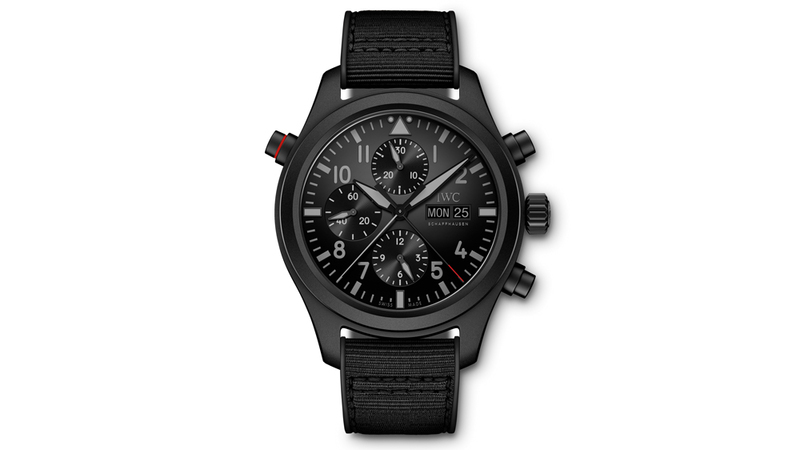 The claim to fame of the new Top Gun watch from IWC (around $20,850) is that it also comes in a never-before-used material in the collection—Certatanium. The material combines the technical advantages of titanium and ceramic (known for being durable and lightweight). IWC boasts another patent for the material, which it developed in-house. The material is also said to be corrosion-resistant and its black colour makes for a handsome new all-black edition of the Big Pilot Top Gun. It is the first completely black design from the brand that doesn’t involve using a coating—this also includes its push-buttons and pin buckles. The watch comes with a double chronograph with an integrated split-seconds hand and is powered by the 79230 calibre with 44 hours of power reserve. Limited to just 250 pieces, the 46mm by 15.2mm watch (around $17,230) is a big tribute to a project aimed at restoring an old Spitfire that will then be flown around the world. Pilots Steve Boultbe Brooks and Matt Jones will be embarking on their “Silver Spitfire-The Longest Flight” project starting this summer with the new IW395501 on their wrists. 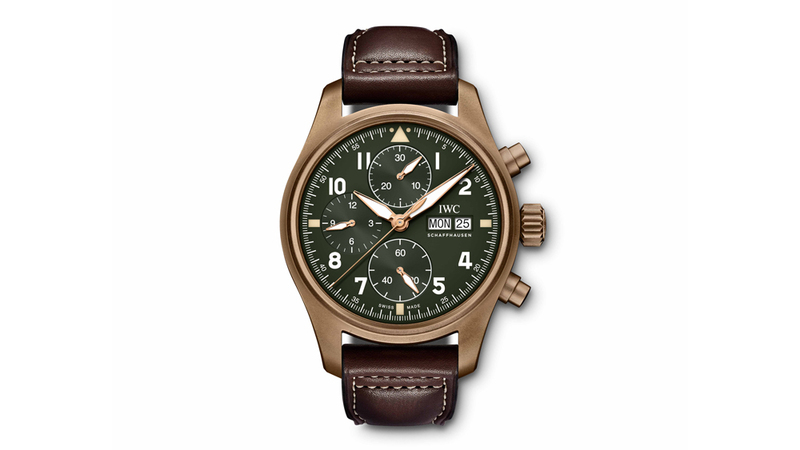 This new 41mm by 15.3mm chronograph will be IWC’s bread and butter introduction. 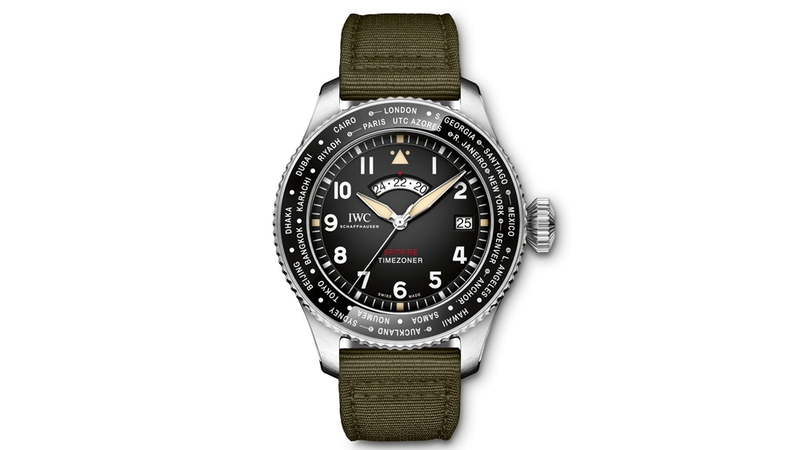 Priced at $8,690 and in a smaller size than the other pilot’s watches, it is the most accessible timepiece of the new releases. It is the first time the watch is being offered in a 41mm size. But for those who care more about what’s in the guts, this watch is the first Pilot’s Chronograph to use a movement from the 6900 family (which was first introduced in 2016). The in-house 69380 calibre has a classic column wheel design and has two subdials at 9 o’clock and 12 o’clock, along with a date and day display. It has a power reserve of 46 hours.